We may prefer to squish them in the West but insects are a staple food source in many cultures around the world. They’re cheap, nutritious, some say delicious, and they’re exceptionally sustainable, according to a new study from the University of Copenhagen. “A lot has been said about the ‘sustainability’ of eating insects, but in reality, there is little research to support these claims,” Afton Halloran, lead author and entomophagy advocate, told Digital Trends. 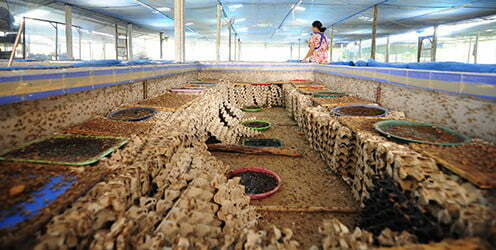 Cricket farming has taken off in Thailand over the past two decades, with around 20,000 small farms spread throughout the country. Companies have now emerged in Europe and the United States specializing in edible insects. With this in mind, Halloran and her team wanted to test claims that cricket farming could be a sustainable alternative to traditional livestock operations, which have a been shown to negatively impact the environment. Using data about fifteen different environmental impacts (from global warming potential to resource depletion), the researchers compared chicken farming in Thailand with broiler chicken farming, a process that Halloran said is already relatively efficient and environmentally friendly compared to beef or lamb. The study showed that cricket farming indeed earns its sustainable title. Sustainability is a big plus but it won’t necessarily make crickets catch on with consumers. “Hands down it needs to taste good,” she said. “There is an overabundance of food in the West, and we select the foods that give us pleasure and that we think are delicious.” That shouldn’t be a problem though — Seattle Mariners fans certainly enjoyed them, devouring over 18,000 crickets in three days at Safeco Field in April. A paper detailing the study was published this week in the Journal Cleaner Production.